Looks Good from the Back: Adrien: This Really, Really Old Thing. This dress is not my favorite but you'd think it was considering how often I wear it. 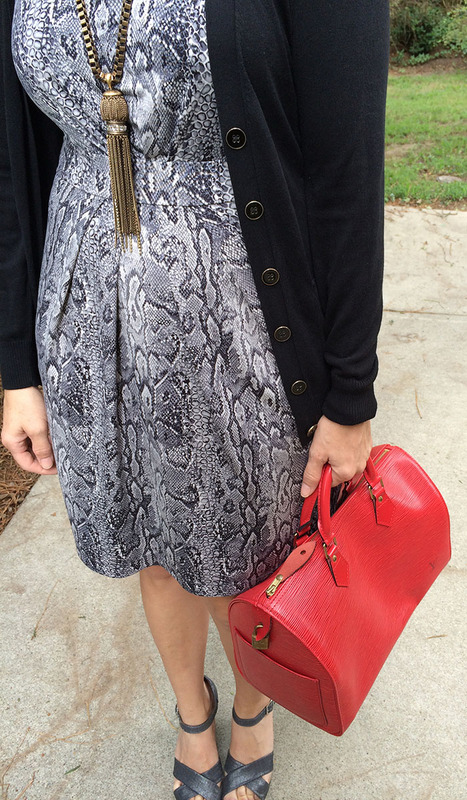 It's been making appearances on LGFTB since the beginning of blog time, which means I've been wearing this odd little snakeskin print BCBG dress for five damn years. I mean. It's not even that good! It's not terribly flattering, the rear view is...odd. And yet? It's probably the easiest dress I own. It's washable, comfortable, goes with almost everything. I wear it A LOT so clearly something is working in it's favor. BCBG is really the best for this sort of dress. This one has a snakeskin print! Hee. One nice thing about this dress is that it really works best with bold accessories. I highly recommend a giant tassel necklace. My bag is vintage LV but I think this red satchel is really damn fine. 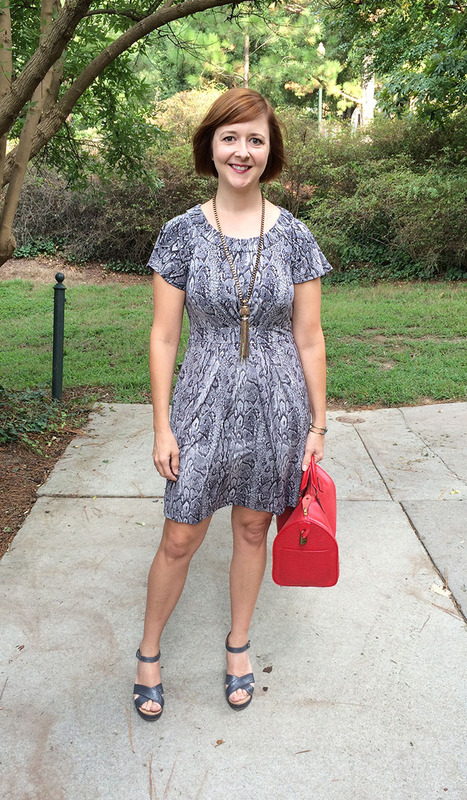 If you have absolutely nothing better to do with your time, here are a bunch of times I wore this dress on the blog. God, my hair. Once again, a super-chic outfit as a final product! 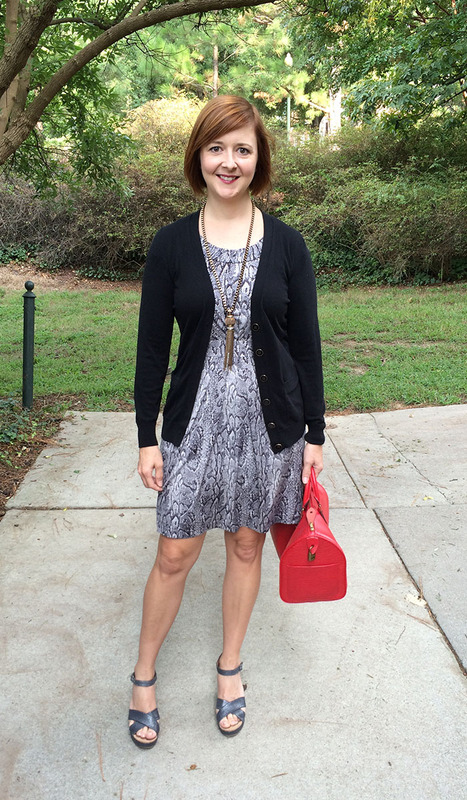 The cardigan, tassel necklace, silver shoes, red bag, modern bobbed hair... all works. The dress by itself on another person probably won't be "flattering" as you said due to the short sleeves (can be hard to wear for many), but you wear it really well. I'm really envious of your abilities but I'm only up to "throw a scarf with everything" so far. ~Anon L.
I love your work style. That said, I have dresses like this, too -- they look good on me but don't please my eyes/brain somehow. Love it! Work dresses with sleeves! When did they become so hard to find? The shape is PERFECT on you: I can see why you keep pulling it out. I think it's hard for a small, large-busted woman to find dresses that flatter. They either hide the tiny waist, or strain across the chest. This one manages to highlight your figure in the best way. I have that cardigan in a deep violet and it's truly one of my favorite things. I have it in black and grey and I DEEPLY REGRET not buying it in every other color. Thanks for the nice comments, you guys!